BRUSSELS (Reuters) - The United States is making serious efforts to comply with a landmark data transfer pact agreed two years ago, EU officials said on Thursday amidst criticism by some civil liberties groups and EU lawmakers that the U.S. is not living up to the accord. The comments came as the European Commission launched its second review of the EU-U.S Privacy Shield which aims to better protect Europeans' personal data transferred across the Atlantic for commercial use. The pact replaced a previous framework known as Safe Harbour, which Europe's highest court quashed in 2015 because it gave U.S. spies excessive access to personal data. About 3,800 companies have signed up to the pact. 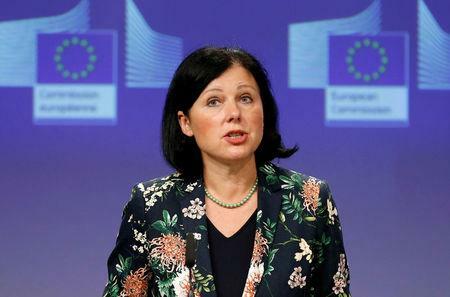 European Justice Commissioner Vera Jourova met U.S. Commerce Secretary Wilbur Ross in Brussels earlier on Thursday to discuss the review. Officials from the Federal Trade Commission, the Office of the Director of National Intelligence (ODNI), the Department of Justice and the State Department, the EU executive and EU data protection agencies will also debate the topic over the next two days. "All this pressure that we have created throughout the year seems to be working," an EU official said, pointing to various measures that the United States has recently taken to adhere to the pact. "Their level of preparedness for the review is a good sign of the seriousness of their approach," he said, pointing to the 50-person U.S. delegation in the room during the exercise. Lawmakers at the European Parliament have urged the Commission to suspend the accord until the United States observes the pact and its obligations in full, such as by appointing a permanent ombudsman. The Commission will publish its conclusions next month.